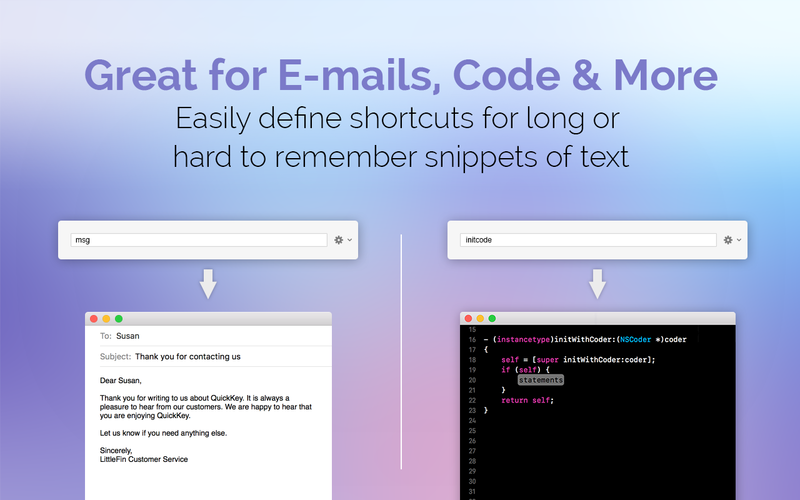 Save time typing by expanding short abbreviations into entire e-mails, code snippets, or often repeated paragraphs. 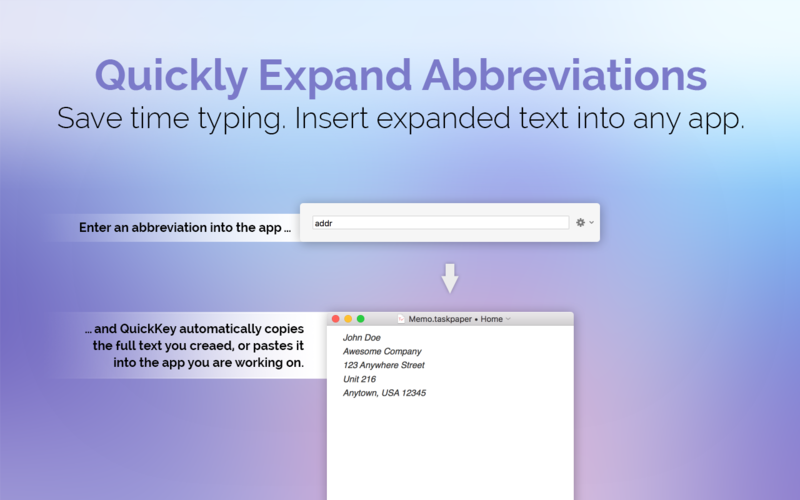 QuickKey allows you to insert expanded text into any app with a simple keyboard shortcut. 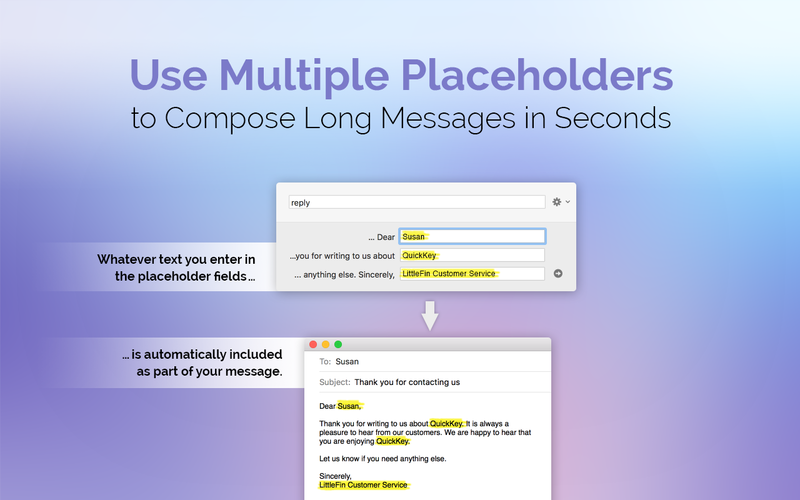 With support for multiple placeholders, you can compose custom messages in seconds. Plus, our free companion app for iOS makes it easy to insert your snippets on the go. Make your life easier with QuickKey. QuickKey saves you time, by allowing you to type entire messages, snippets of code, or long paragraphs with just a couple keyboard shortcuts. Once you define some shortcuts & snippets in QuickKey, it’s a snap to insert them. Just use a global keyboard shortcut to bring up QuickKey, then type a snippet’s shortcut, and QuickKey will automatically paste the full snippet into your document. Respects Your Privacy — QuickKey is the first text expansion app designed to comply completely with Mac App Store guidelines for security and privacy. As such, it respects Mac App Store sandboxing rules, meaning it has zero access to anything you are typing or writing, and doesn’t monitor your key strokes in any way, except to look at the shortcut you type into the app (ONLY when typing into the app, not in any other app). Since QuickKey expands text within it’s own window, instead of inside your document, you are free to use shortcuts that are easy to remember. QuickKey won’t replace them unless you explicitly ask it to. Powerful Placeholder Support — QuickKey supports up to 5 unique placeholders per snippet, so you can insert custom text in the middle of a snippet at the time you insert it. For example, you can add “Dear ?name,” to a snippet, and when you attempt to insert it, QuickKey will automatically prompt you for what name you want to insert. For more details, see our Placeholder page. iCloud Sync & Free iOS App — QuickKey can sync your snippets with iCloud so your shortcuts are available on all your Macs. 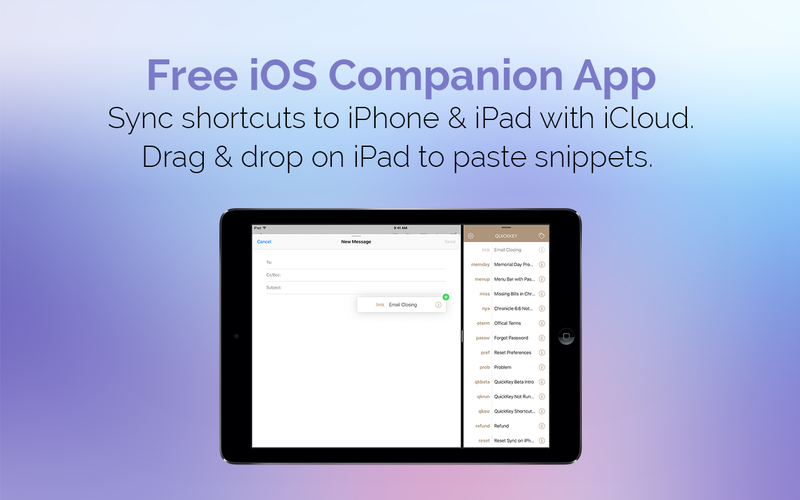 Plus, the free iOS companion app allows you to view, insert or edit your snippets on the go. On iPad, QuickKey for iOS supports drag & drop, so you can drag snippets straight from the app into an e-mail message, for example. All of your data is synced across your personal iCloud account. We do not monitor it or have any access to it whatsoever. Have frequently used phrases saved to insert whenever necessary.